WHEN: May 12, 8 – 11 PM; 2 sets: 8:00 p.m. and 10:00 p.m. In addition to covers of John Coltrane’s “Crescent” and Paul Simon’s “Bridge Over Troubled Water,” the album, his 14th as a leader, features eight ballads by longtime collaborator guitarist Johnnie Valentino. 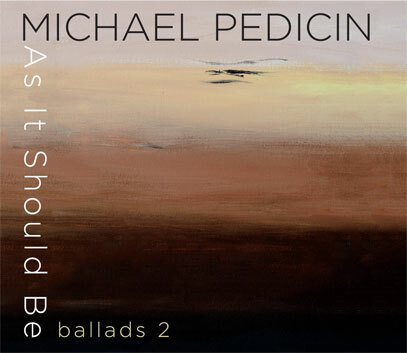 Pedicin and Valentino are joined on the recording by Frank Strauss on keyboards, bassist Mike Boone, drummer Justin Faulkner (of Branford Marsalis’s band), and percussionist Alex Acuña. With the exception of Acuña, all are either from, still live in, or have roots in Philadelphia. Pedicin also continued his non-musical education, earning a Ph.D in Psychology from the Philadelphia College of Osteopathic Medicine/International University for Graduate Studies in 2002. The shingle above his office in Linwood, NJ, reads “Dr. Michael Pedicino” as he recently changed his last name back to the one immigration gave his grandfather in 1906 when he arrived at Ellis Island from Foggia, Italy. While he has no plans to change his name in the world of music, he is in the process of obtaining dual American-Italian citizenship.